The Super Cub C125 marks the evolution of the legendary Super Cub, which has been sold in over 160 countries and in excess of over 100 million units! Now Honda welcomes a new chapter in the Cubs unique story with the release of the C125, designed for modern life in a busy city, it's timeless design expresses value and universality and offers a new level of performance with a modern engine and updated handling ability. Fast-forward to 2017 - nearly 60 years later when the 100 millionth Super Cub rolled off the production line, making it the most popular motor vehicle the world has ever seen. Along the way, the Super Cub's simple attributes of style, reliability, frugality and sheer usability have never gone out of fashion; it has quietly achieved exactly what Soichiro and Takeo wanted - to get people mobile and keep them mobile. Up until now the latest model - the Super Cub C110 - has been available in Japan, where it's proved popular with business users including the Japanese Post Office and in South East Asia, where it's found a place in people's homes as private transport. 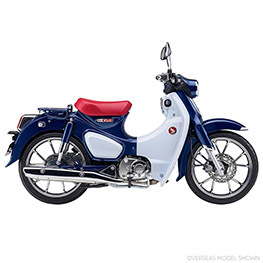 Aware of a demographic of urban riders - both younger and more mature - who are looking for retro-inspired machinery with real credibility and head-turning style, Honda is pleased to offer the Super Cub C125 to the Australian market. The C125 is an evolution of the legendary Super Cub machine and the next chapter in its long history, designed for modern life in a busy city. Its timeless design expresses value and universality and offers a new level of performance with a modern engine and updated handling ability. Just like it was for our founder, the new C125 is designed to put joy and positivity into daily life - and will put a big smile on the face of every Super Cub owner whenever and wherever they ride it. The Super Cub C125 marks a new page in the unique story of a vehicle with such universal appeal that it has been sold in over 160 countries and with such an instantly-recognisable look that it was the first vehicle in Japan to be granted a 3 dimensional trademark. While the look of the new Cub does not deviate from the classic template, an increase in power and torque thanks to its 125cc engine helps keep the Super Cub ahead of city traffic; its automatic centrifugal clutch has also been upgraded to match the output boost and give ultra-smooth, quiet gear changes. The steel frame too, has been optimised with a tuned rigidity balance that maintains the Super Cub's famously welcoming usability. Longer travel front and rear suspension, 17-inch cast aluminium wheels and disc front brake deliver a supple, confident ride with strong stopping power. Full LED lighting brings a modern touch, the Smart Key day-to-day convenience. Pearlescent paint highlights the evocative design of the Super Cub C125, it is available in Pearl Niltava Blue. Simple, robust, reliable, economical is the Super Cub C125 engine in a nutshell. The air-cooled two-valve fuel-injected SOHC 125cc unit has been enhanced cosmetically with a matte metallic-look paint finish and chrome detailing to give it a premium look, and also updated internally to improve the riding experience. Bore and stroke are set at 52.4 x 57.9mm, with compression ratio of 9.3:1. The gearbox is a 4 speed unit and - in classic Super Cub tradition - gear changes are operated via an automatic centrifugal clutch, without the need for a clutch lever. This makes it the ultimate user friendly machine, ideal for learner riders or anyone after an easy, carefree ride. Fun, easy handling has always been another Super Cub strength - it even inspired a Beach Boys song in the 1960s ('My little Honda'). To maintain its reassuring nature, but upgrade it for the 125cc specification, the Super Cub C125 started with the C110 tubular steel 'backbone' frame as a base. The rigidity balance has been tuned around the headstock and engine hangers, to optimise performance for the larger capacity engine while handlebars and seat are now rubber mounted. The footpegs also feature rubber inserts. Rake and trail are set at 26.5º/71mm with wheelbase of 1245mm. Wet weight is 109kg. Front telescopic forks feature 100mm travel, the twin rear shocks 84mm to soak up bumps (10/19mm more than the C110) while elegant 17-inch cast aluminium wheels add stability and steering precision. Tubeless tyres are fitted, sized 70/90-17 front and 80/90-17 rear. A 220mm front disc brake and single-piston caliper is matched by a 130mm rear drum. The Super Cub 125 is designed with one word in mind: universality. In other words, it has to be easy for a wide range of people to use. A key part of this ethos is the laid-forward 'S-shaped silhouette', which runs from the step-through space to rear mudguard, making access on and off easy. There is a clean, high-quality look and feel to all the detail parts, with an elegant balance between the smooth, gently-curved body parts and the hard edge of the leg guards and front and rear mudguard tips. The rear guard is ultra-thin - and made of pressed steel rather than plastic - to help emphasize the classic 'S-shape' silhouette. A key element of Super Cub from the first model is the 'unit' steering, which unifies the separate elements - forks, handlebars and leg shields - into one cohesive whole. On the original machine the handlebars, shaped to be like the wings of a bird, were a tactile and welcoming sales point and the new Super Cub C125 - with its forged, tapered handlebar wrapped in curvaceous moulded resin incorporating the switchgear and instruments - mirrors this motif. All lighting is contemporary and crisp LED while the instruments highlight the depth of the overall design with two lenses separated by dual chrome rings; the outer ring houses the sweep of the analogue speedometer's needle plus warning lights, the inner an understated, digital display. A modern finishing touch is the Honda Smart Key; put it in a pocket and forget about it, the Super Cub C125 is live and good to go. It also controls the immobiliser as an extra theft deterrent, and is equipped with an 'answer back' function whereby the indicators will 'blink' at the push of a button to make finding the vehicle easy in busy parking areas. And, with a nod to its forebears (and underlining its Honda history) a historical 3D 'Old Wing' logo crowns the Smart Key fob.